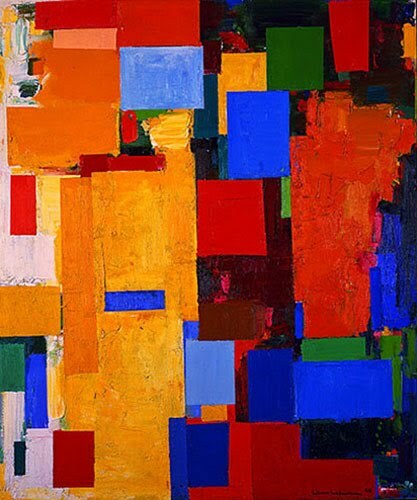 Hans Hofmann, born on March 21, 1880, was one of the foremost figures of postwar American art. Known for his energetic, color-infused work, and renowned as a visionary teacher for many other artists—first in his native Germany, then in New York and Provincetown—Hofmann played a pivotal role in the development of Abstract Expressionism. Much of this was done while he lived and worked in the Village, particularly within the Greenwich Village Historic District (GVHD). 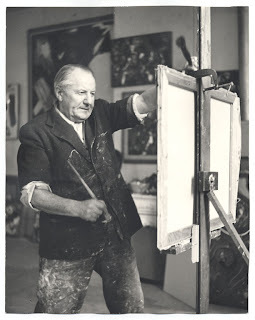 Between 1900 and 1930, Hofmann lived in Munich, Paris, then Munich again. But starting in 1932, and for the next four decades, he lived in New York and in Provincetown, Massachusetts. In September of 1932, Hofmann moved to New York, and one month later he taught an evening drawing class at the Art Students League. Later that year Hofmann left the Art Students League to teach private art classes at 444 Madison Avenue. In 1934 Hofmann began to teach painting and drawing classes full time at the newly founded Hans Hofmann School of Fine Arts, located at 137 East 57th Street. In October of 1936 Hofmann moved the school to 52 West 9th Street in Greenwich Village (and the GVHD), a still-extant rowhouse with a dramatic two-story studio window within a setback balcony. 52 West 9th Street, the location of his school in 1936. Source Municipal Archives 1940’s Tax Photos. From 1936-8 Hofmann lived on the block, at “The Portsmouth,” a fashionable brick elevator apartment house at 38-44 West 9th Street (in the GVHD), built in 1882. Among the not-yet-famous artists that benefited from the tutelage of Hofmann’s school was Lee Krasner, who would become one of the foremost Abstract Expressionist painters as well as the wife of Jackson Pollock. Starting in 1937 she attended painting classes on and off at Hofmann’s school for the next three years. In 1938, with Hitler’s Nazi regime growing in power, Hofmann filed an application for U.S. citizenship, which he obtained in 1941. That summer he again moved his school, this time but one block to the south, at 52 West 8th Street (in the GVHD), into a building with an incredibly rich history that includes Jimi Hendrix and is today the home of the Electric Lady Studios. 52 West 9th Street. From Municipal Archives, 1940’s Tax Photos. That year, Krasner introduced Hofmann to art critic Clement Greenberg, who would champion his work for the next several decades. Around that time Hofmann moved to 177 West 4th Street (in the GVHD). 177 West 4th Street today. In 1943 after opening her Art of This Century gallery in New York at 30 West 57th Street, art collector Peggy Guggenheim saw Hofmann’s paintings in his Greenwich Village studio during a visit arranged by Krasner. Guggenheim then began organizing what would be Hofmann’s first solo exhibition in New York the next year. Later, Hofmann moved his studio to 53 East 9th Street (since demolished). 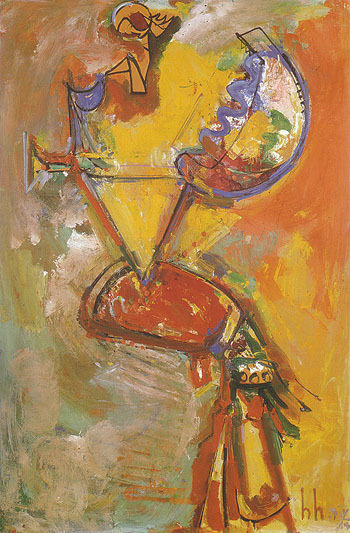 In 1944 Hofmann’s painting Idolatress was shown in the Whitney Annual for the first time, and he was included in 13 additional annuals before his death. Reviews of the exhibition and Hofmann’s work were glowing; in one of them, Hilda Loveman used the term “abstract expressionist” for the first time. In 1950, Hofmann participated in the three-day symposium at Studio 35, 35 East 8th Street, which was an unscripted discussion among 25 artists who came to be known as the Abstract Expressionists, about their own work as well as about the modern scene. In 1957, the Whitney Museum of American Art showed the retrospective Hans Hofmann. To show his appreciation for organizing the exhibition, Hofmann gave the museum his painting Fantasia in Blue. By this time Hoffman was no longer teaching. He had devoted himself to painting full-time and he and Miz moved to an apartment in One Washington Square Village. He died in 1966, leaving a creative legacy infused in and from the Village. Some of his students included: Nell Blaine, Wolf Kahn, Richard Stankiewicz, Robert De Niro, Sr., Lee Krasner, Mercedes Matter, Red Grooms, Joan Mitchell, Helen Frankenthaler, Allan Kaprow, Jan Muller and Larry Rivers.